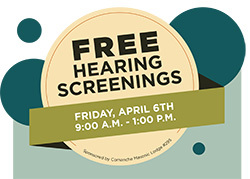 HAYS, Kan. – The last free hearing screening of the semester to be held in western Kansas by Fort Hays State University graduate students will be offered in Coldwater from 9 a.m. to 1 p.m. Friday, April 6, at the Comanche County Health Department, 207 S. Washington. “The FHSU Speech-Language Hearing Clinic is continuing into the second semester of its second year of providing hearing screenings sponsored by a grant from the Kansas Masonic Foundation,” said Marcy Beougher, speech-language pathologist and an instructor in the Department of Communication Sciences and Disorders. “We have screened almost 200 people so far this year and hope to have another successful screening in Coldwater,” she said. The grant provides numerous opportunities for individuals in western Kansas, and in some areas of eastern Colorado, southern Nebraska and northern Oklahoma, to receive important health screening services that are currently scarce or difficult to access. The screenings are available for all ages and will be provided by graduate students from the Department of Communication Sciences and Disorders under the supervision of an FHSU Herndon Speech-Language-Hearing Clinic instructor. Appointments may be scheduled ahead of time, but walk-ins will be welcomed on a first-come, first-served basis. Each site will have four stations, with each screening lasting approximately 15-20 minutes. Information about hearing loss and follow-up services available will be shared during the screenings. Free educational materials and earplugs will be provided by the Kansas Masons. Hearing aids are not available for purchase at the screenings. To schedule an appointment for the Coldwater screening, call the Comanche County Health Department at 620-582-2431. For questions, contact Cecil Puderbaugh at crpuderbaugh@gmail.com or call 620-582-5556. For more information, visit fhsu.edu/herndon-clinic/ or contact the Department of Communication Sciences and Disorders at 785-628-5366.